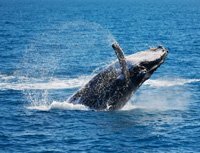 Through the months of June & July / September to November, Humpback and Southern Right whales follow a migratory path along the eastern seaboard of Australia. The coastal waters adjacent to Sydney Harbour are on this path. As these great mammals are constantly on the move, your pilot will gather information from various sources including charter boats, media and the National Parks & Wildlife Service (NPWS) to gain sighting info.